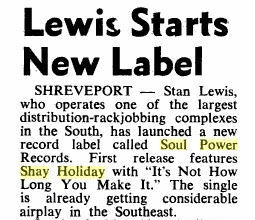 Bobby Patterson and Jerry Strickland’s Soul Power label in Shreveport, LA scarcely put a foot wrong. Almost all the records they put out were first class. Perhaps the best male vocalist on their books was George Perkins, and the most exciting female vocalist was undoubtedly Tommie Young, but Shay Holiday was no slouch. The strutting southern funk of It’s Not How Long You Make It may have been her only recording but it’s a fine vehicle for her vocals. The pity is that this, the first on the label, was to be her only disc. 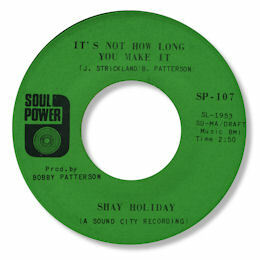 Note ~ "It’s not how long you make it" can be found on the Westside UK CD "Soul Jewels Vol 1". Thanks to Pete Nickols for the fine ad and news snippet.